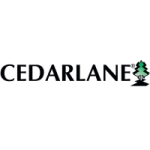 Cedarlane’s anti-Mac-2 monoclonal antibody specifically binds the mouse Mac-2 antigen (also cross reacts with human). The antibody recognizes a 32,000 dalton surface antigen found on a subpopulation of mouse macrophages. It reacts with peritoneal exudate macrophages where the exudate is provoked by thioglycollate, protease peptone (20%), macrophages of lymphoid and non-lymphoid tissues, interdigitating dendritic cells and Langerhans cells. 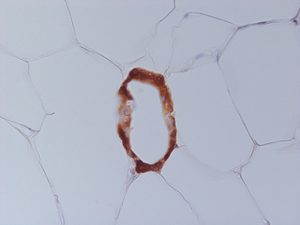 Mac-2 is also expressed in the cytoplasm on non-elicited resident macrophages; 5% are strongly reactive, the remaining 95% show much weaker staining. The antibody does not react with peritoneal exudate macrophages where the exudate is provoked by Listeria monocytogenes, lipopolysaccharide or concanavalin A. It also does not react with peritoneal macrophages, splenic macrophages, granulocytes, thymocytes, peripheral lymph node cells and with 99% of bone marrow cells. 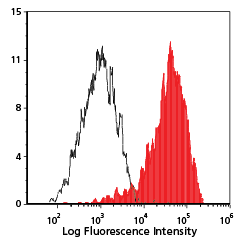 CL8942 antibody can be used for indirect immunofluorescence staining, including flow cytometric analysis of live cells. The addition of propidium iodide is optional; its use eliminates staining artifacts caused by dead cells (1). This antibody is also suitable for frozen sections (4,5) and paraffin sections (7) (recommended starting dilutions of 1:1000-1:2000); ELISA (6); and Western Blot. 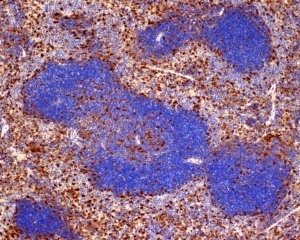 Thioglycolate-elicited C57BL/6 mouse peritoneal macrophages were stained with anti-Galectin-3 (clone: M3/38) (filled histogram) or rat IgG2a isotype control (open histogram). 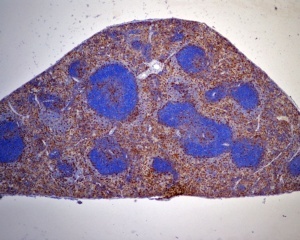 Purified Anti-Mac-2 (CL8942AP) staining of FB10A mouse spleen at 4x (left) and 10x (right) magnification. (Anti-Mac-2 (CL8942AP) was used at a dilution of 1:1500 or 1:2000 with the incubation of 1 hour at RT). Image provided by Nina Volokh, Baldwin Lab, Cleveland Clinic Foundation. CL8942AP (Anti-Mouse/Human Galectin-3) staining (0.5 µg/ml) of a mouse sinus atherosclerosis plaque (aortic roots in heart), paraffin-embedded tissue section; seen at 5x (left) and 10x (right) magnification. Image provided by Dr. Behrooz Sharifi’s lab at Cedars-Sinai. CL8942AP (Anti-Mouse/Human Galectin-3) staining (0.5 µg/ml) of a mouse heart, paraffin-embedded tissue section; seen at 20x (left) and 40x (right) magnification. Image provided by Dr. Behrooz Sharifi’s lab at Cedars-Sinai. 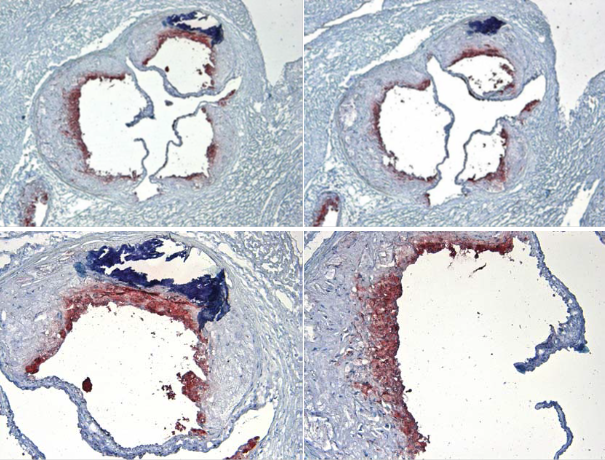 CL8942AP (Anti-Mouse/Human Galectin-3) staining (0.5 µg/ml) of mouse sinus atherosclerosis plaque (aortic roots in heart), OCT (Frozen) tissue sections; seen at 5x (top) and 10x (bottom) magnification. Image provided by Dr. Behrooz Sharifi’s lab at Cedars-Sinai. 1) Sasaki, K.T., Dumas, S.E. and Engleman, E.G. (1987) Cytometry 8:413. 2) Springer, T.A. (1981) J. Bio/. Chem. 256:3833. 3) Ho, M.K. and Springer, T.A. (1984) Methods in Enzymology 108:313. 4) Knisley, K.A. and Weitlauf, H.M. (1993) Journal of Reproduction and Fertility. 97:521. 5) Weitlauf, H.M and Knisley, K.A. (1992) Biology of Repoduction. 46:811. 6) Saada, A., Reichert, F. and Rotshenker, S. (1996) The Journal of Cell Biology. 133:159. 7) Kowala, M. C. et al. (2000) Atherosclerosis 149: 323-330. 8) Cua, D.J. et al. (1995) Eur. J. Immunol. 25: 2318-2324. 9) Ho, M-K. et al. (1982) J. of Immunol. 28 (3):1221-1228. 10) Mey, A. et al. (1996) J of Immunol. 156: 1572-1577. 11) Leenen, P.J.M. et al. (1986) Differentiation 32: 157-164. 12) Huang, H. et al. (1992) Laboratory Investigation 67 (1): 138-146. 13) Kanter, JE. et al (2012) PNAS. 109(12): E715-24. 14) Freitag, TL. et al (2010) Gastroenterology. 139(1):281-91. 15) Waki, H. et al (2007) Cell Metab. 5(5): 357-70.